A map marking the location of the Carthusian monastery at Charterhouse in 1520. This provides a visual understanding of how Charterhouse's location tied in perfectly with its mission. Laying just outside of Cripplegate in the open moor fields to the City's north and west, Charterhouse, with it's monastic neighbors at the priories of St. John and St. Bartholomew, sat at a location removed from the hustle and noise of the City, but within reach of those longing for peace, seclusion, and spiritual contemplation. Despite the urbanized environment around the present-day Charterhouse, it still retains the secluded serenity that drew laymen and clergy alike during its 170 years of operation. 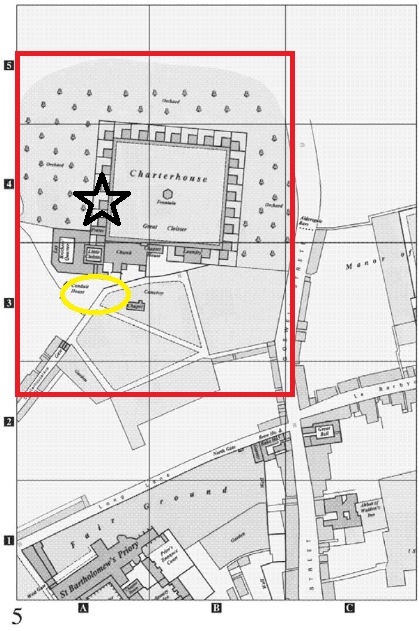 Note: the black star denotes the location of Cell B while the yellow oval denotes the location of the monastic wall and gatehouse. 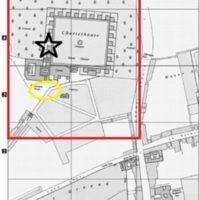 Historic Towns Trust, “Map of Charterhouse in Medieval London (in 1520),” Medieval London, accessed April 22, 2019, http://medievallondon.ace.fordham.edu/items/show/190.